One of the tricks of the fountain of youth is what you eat. You truly are what you consume, especially as you age since your body isn’t as forgiving. Your metabolic rate decreases and your ability to breakdown and digest foods is greatly reduced. Weight now can pack on quicker and muscle tone can be harder to retain. Hence even more of a reason to eat clean. When eating clean, your daily meals area a combination of lean means, complex carbohydrates and healthy fats which keeps blood sugar levels stable and wards off hunger. The foods are natural, free of added sugars, hydrogenated fats, trans-fats and anything else that is unnatural, unnecessary and unhealthy. Meals are more frequent, three main ones and two to three small snacks a day, to rev up your metabolism and curb your appetite. One of my own fun tasks with my clean eating diet is finding recipes that feel like I’m indulging then restricting. It’s all about getting creative, inventive and experimenting. Below are just three of my favorite morning recipes that I are simply delicious and yet clean! Scrambled Egg Whites with Spinach, Tomatoes and Ground Turkey: Cook 1 pound lean ground turkey in a medium skillet until cooked through and lightly browned. Drain excess juices from the pan. Place turkey in a bowl and set aside. Wipe the pan clean with a paper towel. Scramble 8 egg whites until dry. Add scrambled eggs to cooked turkey. In a small skillet coated with cooking spray, lightly sauté 2 coarsely chopped tomatoes, 2 c. shredded spinach and 1 clove garlic, minced or pressed through garlic press. In a large skillet combine all ingredients and mix until evenly distributed. Season with sea salt and pepper to taste and serve immediately. Serves 6. Nutritional facts (per serving): 114 calories, 8 calories from fat, 24g protein, 2g carbs, 0.59g dietary fiber, 1g sugars, 120mg sodium. 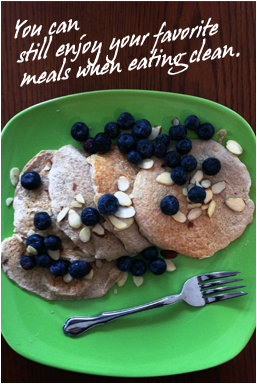 Blueberry Almond Pancakes: Heat a pancake griddle to 375. In a blender, blend together 6 egg whites, ½ c. old fashioned oatmeal (not instant), a splash of vanilla extract, pinch of cinnamon powder, pinch of stevia, 1/4 tsp. baking soda, and 1/2 tsp. flaxseed oil. After coating griddle with cooking spray, drop batter by spoonful onto the pan. When bubbles start to form, place evenly on pancake about 1 tbsp. fresh blueberries. Let them set in before flipping the pancake. When ready to serve, top with additional blueberries and sliced almonds. Makes 1 service of 6 pancakes, depending on the size. Nutritional facts (per serving): 287 calories, 3g fat, 37g carbs, 28g protein. Apple Pumpkin Muffins: Preheat oven to 375. Line muffin pan with paper or silicon liners or coat with cooking spray. Combine 1 c. old fashioned oatmeal (not instant), 1/2 c. canned pumpkin, 1/2 c. unsweetened applesauce, 1/2 c. milk or milk alternative or 1/2 c. apple juice, 2 large egg whites + 1 yolk (lightly beaten), and 2 tbsp.+ 1 tsp. canola oil. Mix until all ingredients are blended. Measure and mix all dry ingredients: 1 tbsp. double-acting baking powder, 1/2 tsp. baking soda, 1 tsp. cinnamon, 1/4 tsp. ground nutmeg, 1 tsp. pumpkin spice, 1/2 c. amaranth or quinoa flour, 1/4 c. whole wheat flour and 1/4 c. maple sugar flakes. Make a well in the center and pour wet ingredients into dry. Add dried fruit if desired. Mix until dry ingredients are just moistened. Fill muffins cups 2/3 full. Bake 15 – 20 minutes or until lightly browned on top. Makes 12 muffins. Nutritional facts (per serving): 189 calories, 78 calories from fat, 6g protein, 21g carbs, 2g dietary fiber, 8g sugars, 25mg sodium. Have a favorite eat clean recipe? Please share below! Be Fit. Be Strong. Be Well.